The first thing you learn when hiking in Grand Canyon is that, contrary to what you originally think, going up is easier than going down. Back country here is very different from other parks since you are often within sight of populated areas (but it can still be impossible to get there). All travel below the rim depends on water. Either where it is for drinking or how much there is for rafting. 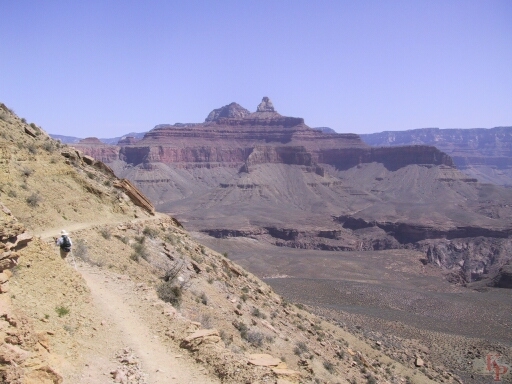 Almost all the trail traffic is on the 3 trails that meet at Phantom Ranch. 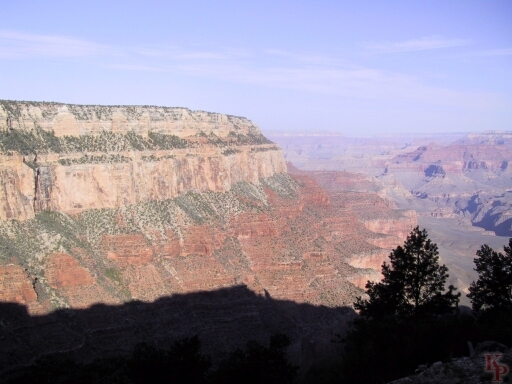 -- Bright Angel, North Kaibab, and South Kaibab. 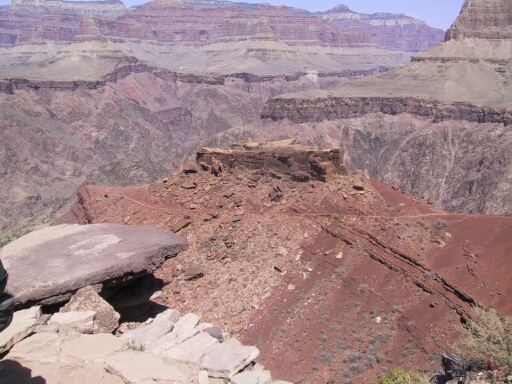 South Kaibab Trail, Top. The trail starts at the side road on the Yaki Point road. Access is via the regular shuttle or the special early morning hiker shuttle. If hiking, you want the hiker shuttle. On the way down and around Cedar Ridge, as you come out of the side canyon you pass Ooh Aah Point. The views, always incredible, slowly change. Past Skeleton Point, which is the first good view of the river, the color changes and the drop continues. The Tonto Plateau looks so flat from above, but don't be decieved. All it means is that even though the switch backs end, the trail is just as steep. At the end of the Plateau, the final drop begins at the Tipoff. Panorama Point provides views up and down the canyon and to the river below.